It’s no coincidence the monolithic “Mother Canada” statue proposed for the controversial war memorial on Cape Breton (and discussed in previous ActiveHistory posts here, here, and here) is the figure of a woman. Although women make only rare appearances in public memorials to the Great War, the “Mother Canada” statue evokes a long and potent tradition of both state and civilians mobilizing motherhood as the symbol of sacrifice in wartime. In her design, cowled and garbed in a flowing gown, “Mother Canada” is modeled after the monumental mother at the front of the Vimy memorial in France; she in turn bears a distinct likeness to images of Mary the mother of Jesus, as well as other prominent bereaved mothers associated with religious traditions such as the Jewish Maccabean mother of seven martyred sons, or al-Khansa the Muslim mother of four sons who died fighting for their faith. Each of these mourning mothers is portrayed in art and literature as grief-stricken but steadfast, holding true to her faith and ideals, and demanding that we remember and value the sacrifices they and their sons have made. A woman whose body once gave life to the dead child she now mourns, enjoining – sometimes demanding – that the population honour her loss: this is the stuff of a propagandist’s wildest dreams. 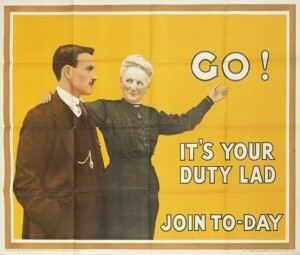 No surprise, then, that during the Great War “mother stories” were among the techniques used to spur military enlistment and civilian self-sacrifice. When Prime Minister Borden pledged 500,000 recruits from Canada in his New Year’s message of 1916, fictitious mothers, some noble and some wicked, were pressed into service to help fill the ranks and counteract the lengthening casualty lists. These stories illuminate the power and moral authority of the symbolic mother in wartime. The fact that the mothers are usually nameless suggests that they are meant to be read not as unique cases, but as archetypes, with women reading themselves into the role of the mother in question. On 27 July 1916 the Manitoulin Expositor, a newspaper that had served Lake Huron’s Manitoulin Island since 1879, published “The Tragic Story of a Woman who would not let her menfolk fight.” Although it was authorless and the woman in question was nameless, the story was vouched for by a respectable source, Lt.-Col. Charles Hugh LePailleur Jones of the 227th (“Men o’ the North”) Battalion. Jones was a university-educated Montrealer then living in Sault St Marie, actively trying to muster a company’s worth of soldiers from Manitoulin for his battalion. The aim of his labour and that of the story neatly coincided. In this story, “Mrs. ______” is introduced as having a husband and two sons, age 19 and 21. Being “red-blooded Canadian boys” the menfolk know “the necessity of Canada sending 500,000 men mean[s] they should do their duty and join the colours.” But their mother, instead of using her power of moral suasion to encourage her sons to join the fight, strenuously objects and through “selfish” and “unpatriotic” argument prevents them from enlisting. Terribly ashamed, the boys follow tragic paths. The older boy leaves home and becomes an alcoholic in Toronto; in a drunken stupor he steps onto the tracks and into the path of an oncoming train while travelling home on Christmas Eve. “What was left of him,” the author intones, “was taken to the morgue in a box and the mother never saw him again.” The mother’s second son then becomes mysteriously ill and dies. The father, a 50-year-old man now filled with remorse, and presumably atoning for his wife’s failures, joins up and goes to France. The mother is left “a lonely, broken-hearted woman… [who] did not love her sons well enough to want them to do their duty.” The author promised readers further “stories of women who prevented men going,” implying similarly dark consequences for their behaviour. We may smile at this melodramatic fiction now, but in the wartime climate of fear and powerful community pressure to be seen “doing your bit,” this theme, continually repeated, might have preyed upon anxious minds. Lest readers think this mother cold-hearted, Reverend Forson adds, “Rest assured she felt the pain of her loss just as keenly as any other mother who has lost her son.” He emphasizes the mother’s honourable sentiments, comparing her sacrifice to that of the biblical Jacob in the story of Joseph and the Coat of Many Colours, writing that “… she was willing to see her Benjamin go forth from the home, possibly to share the same fate as his brothers.” Drawing upon his and his audience’s shared Judeo-Christian background, Forson called this willingness to lose a most beloved child “something too sacred even for praise. This is in the nature of a Divine sacrifice.” Like Jacob and his son Benjamin, or Mary and her son Jesus, the nameless mother was “willing to give her last boy to the great Cause.” The implication was that others should strive to emulate this heroism. These days, over-the-top rhetoric like this might make our blood run cold, as we wonder what our grandmothers and great-grandmothers thought of such tales. But the sacrificing mother remains a powerful icon in conflicts around the world: for instance, the name of the seventh-century poet and mother of four martyrs, al-Khansa, was recently adopted by the Islamic State of Iraq and al-Sham (ISIS) for its all-women moral police brigade, and by al-Qaeda for its online women’s magazine created to help train women in the art of fighting. “Mother Canada” may be envisioned by her creators solely for commemorative purposes in 2015, benignly reaching out to her soldier-sons buried abroad, but in the past she was actively mobilized to send them to war in the first place. In future, might she once again be called upon to encourage young Canadians to fight? Dr. Suzanne Evans, author of Mothers of Heroes, Mothers of Martyrs: World War One and the Politics of Grief (McGill-Queen’s, 2007) writes in the field of women and war. Reprinted in Special Edition of The Manitoulin Expositor 12 September 2001, 5. Graves, Robert. Goodbye to All That (Cassell, 1966) 202.